I am pleased to greet you on the occasion of your General Assembly, in which the XXV anniversary of the Union of male and female Conferences is celebrated. These years of close collaboration between religious and religious have been, without a doubt, fruitful. Constraints of fraternity, of reciprocity and of communion have been created, both in the tasks proper to the Confer and through solidarity and help between consecrated persons and consecrated persons in many moments and circumstances. 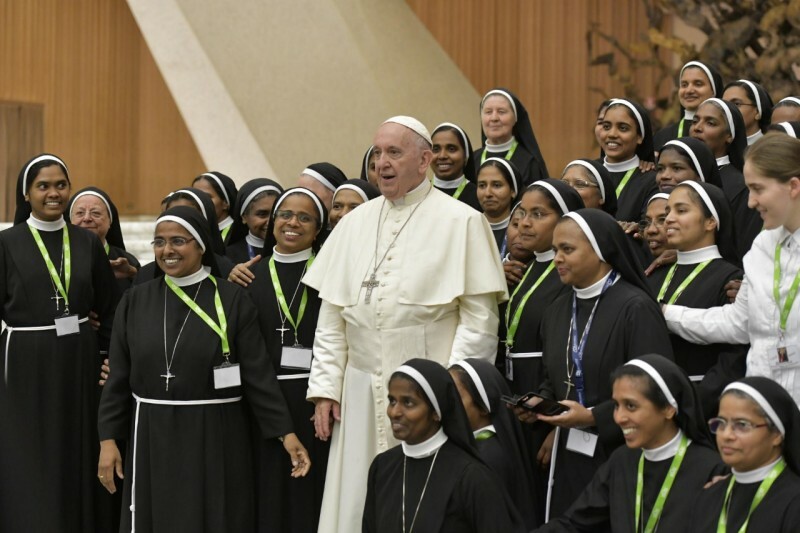 I invite you to look with confidence at the future of consecrated life in Spain, according to the motto chosen for this assembly: "I will grant you a future full of hope" (see Jer 29, 11). The Lord gives us hope with his constant messages of love and with his surprises, which at times may leave us disoriented, but help us to get out of our mental and spiritual closures. His presence is of tenderness, accompanies us and commits us. This is why he says: "I know the projects I have done for you ... projects of peace and not of misfortune, to grant you a future full of hope. You will invoke me and appeal to me and I will grant you; you will seek me and find me, because you will seek me with all my heart; I will let myself be found by you ... I will change your destiny for the better "(Jer 29, 11-14). The journey accomplished as Confer has a fruitful history, full of examples of hidden and silent dedication and holiness. We must not spare efforts to serve and animate the consecrated life of Spain, so that we do not miss our grateful memory, nor our gaze towards the future, since there is no doubt that the state of religious life, without hiding uncertainties and worries, is full. of opportunities and also of enthusiasm, passion and awareness that consecrated life today makes sense. The Church wants us prophets, that is men and women of hope. Rightly one of the objectives of the year of consecrated life encouraged "to embrace the future with hope". We know the difficulties of religious life today, such as the reduction of vocations and the aging of its members, economic problems and the challenge of internationalization and globalization, the pitfalls of relativism, marginalization and social irrelevance. .; but in these circumstances our hope is raised in the Lord, the only one who can help us and save (see Apostolic Letter to all consecrated persons on the occasion of the Year of Consecrated Life, 21 November 2014, No. 3). This hope leads us to ask the Lord of the harvest to send laborers to his harvest (see Mt 9:38), and to work in the evangelization of the young so that they may open up to the call of the Lord. This is a great challenge: being close to the young to infect them with the joy of the Gospel and belonging to Christ. We need bold religious, who open new paths, and to present the vocational question as a fundamental Christian option. Every stretch of history is God's time, even ours, because his Spirit blows where he wants, as he wants and when he wants (see Jn 3: 8). Whatever moment and circumstance can turn into a "kairos", one must only be careful to recognize it and to live it as such. Mary, our Mother, who "kept all these things pondering them in her heart" (Lk 2:19), will help us to contemplate and look at all that we do not understand of the present moment, welcoming it, waiting for a future that, though different, will continue to be fruitful for the consecrated life. Consecrated life walks in holiness. As religious we must torment ourselves, spend and get tired by living the works of mercy, which are the program of our life (see Apostolic Exhortation Gaudete et exsultate, No. 107). It is not a matter of being heroes nor of presenting ourselves to others as models, but of being with those who suffer, accompany, search with other alternative paths, aware of our poverty, but also with the trust placed in the Lord and his love without limits. Hence the need to listen again to the call to live with the Church and in the Church, coming out of our schemes and comforts, to be close to human situations of suffering and discouragement that await the light of the Gospel. There are many challenges to religious life today. The reality in which we live requires answers and bold decisions in the face of these challenges. Times have changed and our answers must be different. I encourage you to give an answer, both to structural situations that require new forms of organization, to the need to go out and seek new presences to be faithful to the Gospel and channels of God's love. The life of prayer, personal encounter with Jesus Christ, community discernment, dialogue with the bishop must be prioritized when making decisions. We must live with humble audacity, looking to the future and in an attitude of listening to the Spirit; with him we can be prophets of hope. May the Lord bless you and may the Virgin Mary accompany you and help you discover the path to follow. And please do not forget to pray for me.